By 2035, Aviation will experience a greater change than it went through over its first 80 years as a commercial industry. It has already been through three strategic eras, from (i) the era of monopolies (until the 1980s), to the eras of (ii) continental competition, until the mid-2000s. Then it entered the era of (iii) hyper-competition, which is now at its peak. The industry will soon go through a transition phase between hyper-competition and the next era, (iv) hyper-cooperation, which we can foresee now thanks to early signs. The previous eras saw great changes, such as hub & spoke and low-cost airline operations, new generations of narrow and widebody aircraft, the emergence of commercial activities at airports, and the first cooperation between “different species” (e.g., interline agreements between low-cost carriers and legacy airlines, joint ventures to develop new aircraft programs). But the pace of change is much faster now, and most of all, none of the previous changes triggered major changes among the different (a) clusters and (b) players in each cluster that compose the aviation industry ecosystem. What could be the possible scenarios for the fifth strategic era of commercial aviation by 2035? How might clusters and players move along the value chain? How will the revenue and profit pools be distorted? What are the key factors that will drive possible scenarios? To answer those questions and define possible scenarios for aviation in 2035, Arthur D. Little analyzed more than 130 trends and possible disruptions impacting the nine main players. These comprised the three main clusters of commercial aviation: aircraft providers (tier 1s, OEMs, MROs, lessors), air transportation providers (airlines, distributors) and infrastructure providers (airports, air navigation service providers, ground handlers). Demand will continue to grow at a fast pace, but the “mass-customization” travellers expect, the emergence of “last-mile aviation for people and goods”, and regulation could shape very different growth trajectories. Airlines’ business models could move towards fully integrated and consolidated global players or to white-label aircraft operators, evolving from generating revenues and profits by selling transportation services to becoming media (or platforms) offering “free tickets”, but monetizing their client bases to third parties. Aircraft providers are seeking to offer aircraft-as-a-service, while investing to consolidate horizontally and offer smarter and more versatile next-generation flying machines. Infrastructure providers will need to make fundamental changes to their operating models in order to cope with anticipated growth and price pressure. Our scenarios are thus based on the “main uncertainties”: the ones with high impact and high certainty of occurrence make up the “base” (but unstable) scenario, and the ones with high impact and high uncertainty of occurrence define key possible directions from the base scenario. In our base scenario, the whole industry moves towards automation of processes and improves margins by leveraging new technologies (data analytics, AI, 3D printing, etc.). Cybersecurity and connectivity enablers become critical for the industry and enable UAV emergence. Consolidated regional, multi-brand airline groups cover numerous customer segments. Airlines have also twisted their revenue generation models towards becoming media platforms, with the most advanced players offering free tickets. Aircraft OEMs compete against mega-tier 1 companies to capture value-add in the aircraft supply cluster and in the market for lastmile aviation. From there, it appears that fundamental drivers will be (i) (de)regulation of the aviation industry (in terms environment, economic, sovereignty, etc.) on one side, and (ii) strategic moves along the value chain on the other. On the regulation side, we consider a “closed” world versus an “open” world. These two worlds are characterized by loose or tight rules for open-sky agreements, airline ownership, personal data ownership, utilization and monetization options, and pricing of air tickets and scarce infrastructure resources. All these regulatory aspects would enable different degrees of consolidation and monetization of key assets by incumbent players (client bases, infrastructures, etc.). Last but not least, environmental regulation would highly impact the demand for air travel. On the value chain evolution side, we consider two opposite options involving airlines and aircraft suppliers, respectively, either expanding or shrinking vertically. We could thus see the emergence of a full-fledged “aircraft-as-a-service” provider (i.e., fleet supplier, manager and operator). We also could see the emergence of “client owners” (e.g., independent loyalty programs) that would reduce the added value of airlines. Or we could see airlines resisting those trends to avoid becoming “white-label” operators. 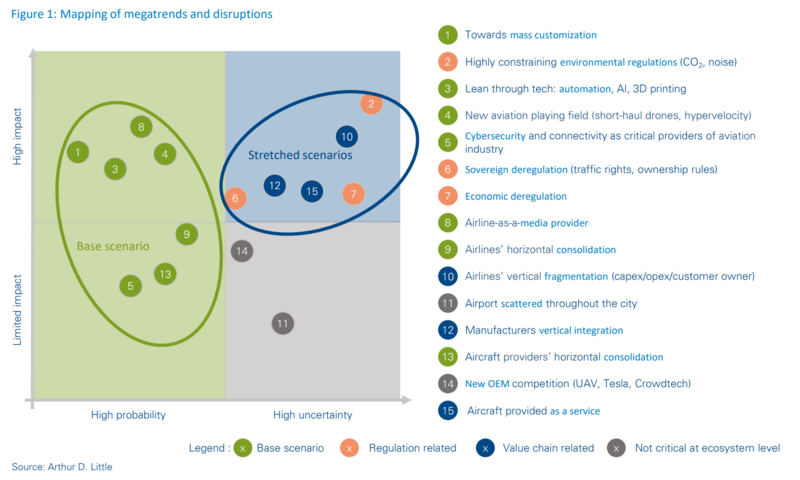 This unveils four “stretched scenarios” for the next strategic era of the aviation industry. In scenario A, “Oligopolies, the exclusive club”, the aviation industry is structured around a set of “global champions” in each cluster of the ecosystem, with large degrees of consolidation and the ability to monetize scarce resources. This enables them to increase the value pool significantly. In scenario B, “Utilities, the calm regatta”, the aviation landscape is shaped like the landscape of utilities today, i.e., around a set of regional champions, with regulated demand, pricing and ownership. Total revenue for the industry is, however, limited by strong environmental regulation, which limits passenger demand. But these conservative regulations are beneficial in that they contain competition and value capture by new entrants. 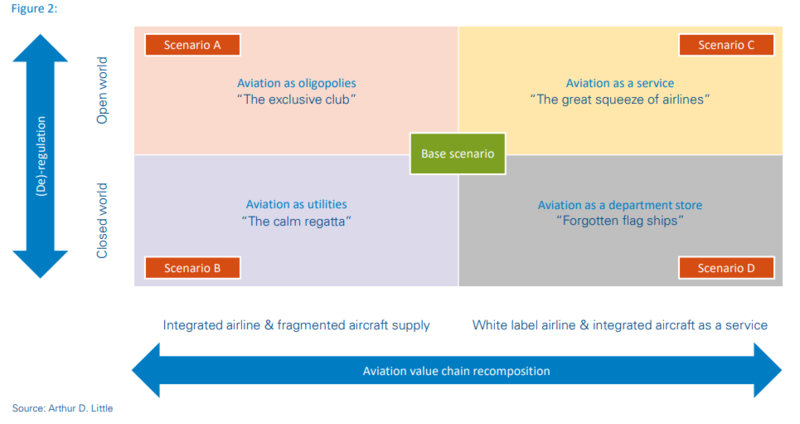 In scenario C, “Aviation-as-a-service, the great squeeze”, airlines are becoming white-label operators, with downstream and upstream suppliers able to capture more value by (a) integrating vertically (“aircraft-as-a-service” companies, airports and air navigation service providers merging to become “total infrastructure providers”), (b) getting client control (mobility platforms, ticket marketplaces, etc.) or (c) yielding their scarce resources (infrastructure providers). This scenario generates higher revenue at the ecosystem level, driven by reduced air-travel ticket prices… but is actually more detrimental to profit because airlines are weakened. In scenario D, “Department store, forgotten flagships”, airlines retain control of customers, but their brands are disappearing: aircraft cabins are monetized to third parties looking for their own brands/products/service exposure, and fleets are managed (but not operated) by “aircraft-as-a-service providers”. Economic and personal data regulation limits the loss of profit for airlines by preventing too much value capture by distribution platforms or infrastructure providers. Despite proposing four distinct global scenarios, we believe aviation in 2035 will be a regional patchwork of these. Indeed, considering differences in regulation appraisal and value-chain maturity, each global region (the US, Europe, India, China, etc.) could go into one scenario or another. Our scenario and economic modeling approach shows very different total revenue and value creation for the aviation industry by 2035 – and possibly even more differentiated revenue and value sharing among players of the ecosystem. Airlines must keep control of scarce resources and clients due to a new perspective of “mediatization”/“platform play”. In addition, Ownership and personal data regulation will be key for transport providers to transfer data from airlines to gatekeepers and consolidate the industry. Aircraft-as-a-service is the new goal of aircraft providers, and cooperation is the best way to achieve it. Economic regulation of infrastructure providers will be key to driving profit sharing with clients, while automation and concentration will create a larger profit pool. How to reshape the offering and revenue generation model of my company (product/service/pricing)? How to transform the operating model and the innovation engine of my company? How to reallocate capital to extend my strategic value by moving across the aviation ecosystem and my cluster?